At least 52,000 people have abandoned their homes in Ethiopia's Somali region after the Wade Shabelle and Genale rivers burst their banks following heavy rains. "Heavy rains pounded western highlands and six woredas [administrative wards] in the Somali region, causing floods," Ramadan Haji Ahmed, head of the government's disaster prevention department in the region, said. "The rain lasted six days from 2 November," he told IRIN. 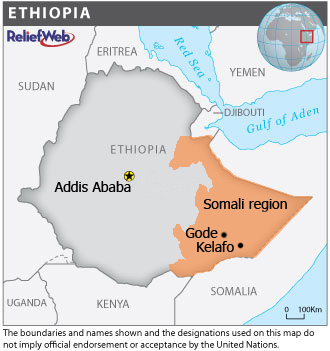 The six woredas were in Gode, Afeder and Liben zones. Ramadan said 36,888 people were displaced and three killed in the worst-affected woreda, Kelafo, in Gode. "The flood hit 14 kebeles [smallest administrative wards] and 85 villages in Kelafo," Ramadan said. "It washed away crops on 164 hectares." Crops were also destroyed in West Emi woreda of Afder zone. "The Wabe Shebelle River burst its banks and flooded 17 kebeles in West Emi," Ramadan added. "Thanks to early warnings, the villagers fled to nearby mountains. The flood damaged crops on 3,200 hectares." At least 10,740 displaced people have been registered in Dolo Odo woreda of Liben zone. "Dolo Odo was flooded after the overflow of Genale river," Ramadan said. "The roads from Dolo Odo to Filtu and Negele are also blocked." Floods cut off the road linking Degahabur town with Gode zone after the Dirkot River burst its banks. "We brought 30 vehicles of aid from Dire Dawa central warehouse but we could not continue to Gode due to the damaged road," Ramadan said. "We are now preparing to use another road." However, he feared the continued heavy rains would hamper relief efforts. "Meteorology reports show there will not be heavy rain in the next three days," he said. "If there is any heavy rain, the only choice is an airlift." The Disaster Prevention and Preparedness Bureau in the region has begun dispatching relief food and was preparing to distribute non-food items. "All affected woredas need emergency relief," Ramadan said. "We have not yet released any appeal, but it will be ready as soon as we get a complete assessment of the situation." In 2007, flooding left 135,000 people displaced across Ethiopia. In August, flash floods in Gambella regional state displaced about 20,000 people.